I wonder where to start with Branson's story. Branson always had a bit of a limp in his elbow. It was diagnosed as "pano" at a early age. As Branson grew, this elbow continued to give him some trouble. Being a Registered Veterinary Technician it seemed Branse was always at work with me. X-rays, follow-ups, lab work you name it. While x-rays revealed beginning stages of arthritis, nothing else came to mind as being serious. In March of 2000, Branson and I were walking along a path on our property here in the Sierra Nevadas when Branson decided to take a flying leap off the hill, landing approx. 4 feet onto our concrete patio. Of course, I freaked. Later that evening, Branson was in pain and wouldn't bend his elbow or put weight on his leg. I started branson on rimadyl and total cage rest, his elbow was terribly swollen and warm, almost hot to the touch. Three days later, still limping, I took him in to see Dr. Barnes. We did another set of x-rays which did show some sort of infection in this elbow. After a quick needle aspirate, we went with exploratory surgery. What we found in Branson's elbow was unlike anything I've seen in my 10+ years as a Vet Tech. It looked like jell-O/mashed potatoes. It had no real consistency to it. I told Dr. Barnes to send a good size sample to the lab. On Monday, March 17th. 2000... The lab confirmed my worst fear. Malignant Histiocytosis Sarcoma. I couldn't believe it. How could this be? 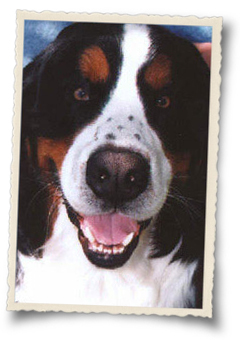 In a Bernese Mtn Dog that just turned 3 years old? Needless to say, it pushed me into complete over-drive. I wanted answers and wanted them fast! We contacted Dr. Peter Moore at UC Davis Veterinary Teaching Hospital here in Northern California. To make a long story short. 100% fatal in all cases! However, there was hope. X-ray his chest to see if his lungs were clear. Ultra-Sound his liver and spleen, if all checked out clear, we planned to amputate Branson's leg. I was ready as was Dr. Barnes. Tuesday Morning April 18th. 2000.... X-rays revealed that the cancer had spread to Branson's lungs. Some of the nodules were the size of a life-saver candy, some bigger, some smaller. His lungs were covered in cancer. All of this, WITHOUT symptoms! No labored breathing, no coughing, no shortness of breath, no loss of energy, nothing from Branson to indicate anything was wrong with his lungs. I took Branson home and made my decision. That evening, I listened to Bransons breathing. Still nothing to alarm me. I held him, talked to him, told him how much he was and will be loved. I had to let him go. I knew what was headed our way and I couldn't sit and watch my baby, die. Wednesday April 19th. 2000... I spent the day brushing Branson, taking pictures of him with the kids, I gave him a large marrow bone and sat on the grass with him for hours, just watching him. My heart-ached, my eyes close to swollen shut from crying. My big-beautiful boy was leaving me and I was a total mess. When my husband came to pick us up, I sat with Branson while we drove to the clinic, he smiled as he always did, his eyes shined, and with his paw on my knee, it became the shortest ride of my life. We spoke with Dr. Barnes, I looked at the x-rays again, for like the 7th or 8th time since the day before, to make sure I guess. I signed all the necessary forms, made my requests for his remains to be returned to me, and made sure that Branson's elbow, lung, liver and spleen tissues went to Dr. Moore at UC Davis. With the necropsy papers signed, I walked Branson for the last time. I held Branson as he was put to sleep. I was the last person Branson seen and heard. My whispers of "I love you" sent him off to be free, in peace, and whole again. In spite of our heartbreak, Branson passed peacefully and in my arms of Malignant Histiocytosis Sarcoma. I will forever remember the 3 wonderful years we had with Branson, all the times he made us laugh, his antics, the endless show traveling we did, the love and protection I felt with Branse at my side, it'll always be with me. Two days after Branson was put to sleep, it was confirmed that MH spread not only to his lungs, but also his liver and his spleen. Branson had a very short time to live, very short. Having this confirmation made me feel better, as in knowing that putting him to sleep was in fact the best thing we could have done for Branson. After Branson passed, I became obsessed with wanting knowledge of MH, putting together a 100 + page Histio Package, and raising thousands of dollars for berner-garde and cancer research. The hundreds of folks I've helped as a result of Branson's cancer was my healing if you will. Today is no different than it was close to 3 years ago now. It gave me life-long friendships. And, it gave me Mo, with Shelley's story. Mo emailed me with her "help" plea. 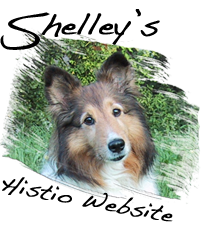 In the end, we have beautiful memories of all the dogs who've succumbed to histiosytosis, most of all, we gained friendships with those that are miles away or in our own backyard. Either way, it's these friendships that are lifelong, that sustain us through the good and the bad times. As we continue to love Bernese Mtn Dogs, Rottweilers, Shelties, Flat Coated Retrievers, all riddled with the gene that causes MH, we'll start the process all over again, however, this time with the knowledge and the strength to get by, that strength derived from our loving friends. Thank you Mo, for Shelley's story and Shelley's pages. Branson and Shelley dance together on their own little cloud.